Usha Ramakrishnan is Program Director of the Doctoral Program in Nutrition and Health Sciences, Rollins School of Public Health. Born and raised in India, Usha Ramakrishnan has seen her homeland make tremendous strides in health. Maternal mortality has decreased substantially over the past two decades. The country has initiated almost universal access to prenatal care, and severe malnutrition has ebbed. But women, especially those of childbearing age, are still undernourished. India's focus, and that of other countries too, should be on encouraging women to improve their diet before and during pregnancy to help ensure healthier babies, says Ramakrishnan, professor of global health and director of the doctoral program in nutrition and health sciences. "We've done a reasonable job in women's health worldwide, but there has been less progress in nutrition indicators," she says. "We've saved the child, but what is the quality of life? Women are undernourished, and that is often ignored as we have focused on children's outcomes." Women who are undernourished are more likely to have low birth weight babies, preterm births, and babies with birth defects or impaired cognitive development. Interventions historically have targeted women once they become pregnant. That's where the game plan needs to change, she says. In India, for example, the government has begun handing out supplements containing iron and folic acid to girls and young women. If women get in the habit of taking supplements as teenagers or young adults, they will continue to do so during pregnancy, she says. "The public health community often gets hung up on the cost of such initiatives," says Ramakrishnan. "People often ask, 'How can we ask developing countries to pay for this?' But if organizations and governments are truly driven by science, they should recommend this. In a broader sense, this is about empowering women. But it's a slow process. We're trying to change behavior at all levels." In Vietnam, where Ramakrish-nan has studied women of reproductive age, she found they were eating mostly carbohydrates, often from rice, a cheap and readily available staple. Subsequently, the women had low intakes of iron and zinc, among other micronutrients. Ramakrishnan now leads a study there in which 5,000 women of childbearing age were given micronutrients, including folic acid. At year's end, her research team will look at the health and development of the more than 1,600 babies born to these women to see how well their infants are faring. "I chose to go into nutrition because I wanted to do something for the community," she says. 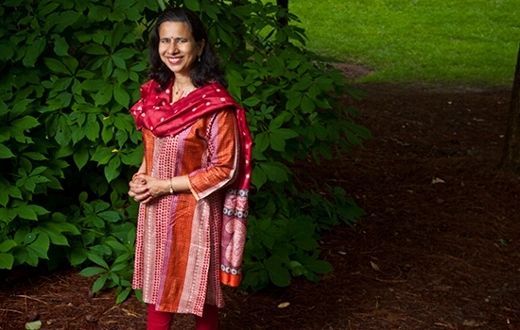 "My goal in India and Vietnam is to help create greater demand for improving women's nutrition. If women start demanding these services, their health and the health of their babies will improve."